Baby hoops, that are big on style. 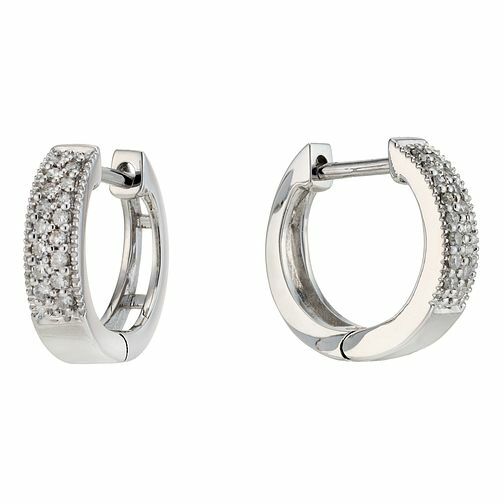 Beautifully finished with shimmering diamonds, these hoop earrings offer effortless elegance. A lovely present for someone you love. Stunning diamond jewellery for all occasions. 9ct white gold & diamond earrings is rated 4.2 out of 5 by 5. Rated 5 out of 5 by Anonymous from Looked really nice and classy. Not too big or too small and very pretty. The ear rings was delivered in store very quickly and the lady was very helpful behind the counter. Rated 2 out of 5 by Anonymous from Beautiful but poorly made I bought these as a present to myself for a promotion at work. They are beautiful and the perfect size to have a bit of sparkle and wear every day. However, the catch at the back is poorly made and I found they kept falling out resulting in me loosing one of them yesterday after only having them for 2 weeks. Very disappointed.